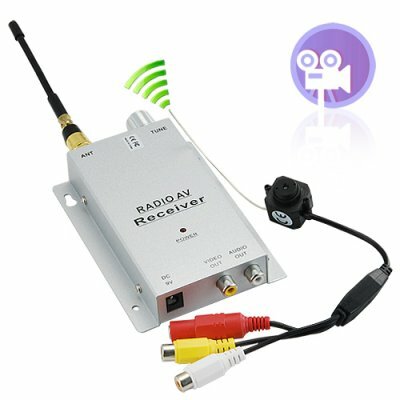 Successfully Added Micro 1.2GHz Wireless Pinhole A/V PAL Camera + Receiver Set to your Shopping Cart. Mini wireless audio and video PAL camera and receiver security set, operating on the long range 1.2GHz transmitting frequency. Perfect for indoor use, this handy wireless set features a camera with low light 3Lux lens and the ability to be used as a wireless or a wired RCA camera, and an AV OUT for easy connection to such devices as a LCD screen or a VCR for recording live audio and video feeds. This wholesale product has constantly been one of the best sellers, and is very popular with Chinavasion customers due to its consistent high quality and its reselling ability. Try it out for yourself today! What is the maximum operating range of the camera?The maximum range is 12-15m. I bought this camera a while back, and I'm pleased with it. The signal isn't too strong though, it picks up perfectly clear when in the same room, or one room away if there isn't too many objects in between, but for the price, I think its a good buy. I just wanted this for video surveillance , so I'm, still happy with the product. I'd recommend this to anyone who has a tight budget and wants to be able to see whats going on at home or work when you're not there. Very good service, fast delivery and good quality. on 2010-09-09 19:34:12 Just arrived and tested.Pretty good results. I just recieved this camera and finished testing it a while ago. At first I could't get a signal on the TV I connected the reciever, but after playing with the tuning wheel( I had to turn it all the way and put a little bit of force) I managed to get a very good signal at 2 meters distance. Then i took the camera at least 10 meters away through a corridor in the house and pluged it in the charger and still the signal was as good as before. For 19$ its a really good deal and I recommend it. Note that, as mentioned in other comments above, if you want to use this camera with your computer, you need to have a TV Tuner card installed in order to connect the reciever's cables. Uma grande qualidade de imagem e de som, atenção que não tem iluminação própria, ou seja, quando está de noite e sem luz, não capta nada... mas basta-lhe apenas um pouco de luz e já capta imagem, magnífico produto. It was great i was able to record my babysitter and fired her the very same day. She was sleeping the whole day while my daughter just sat and watched tv with no food or play the whole 8 hours. I was appalled. GET THIS IT DOES WORK!